HomeWeight LossJuicing for Weight Loss? Juice diets are currently all the rage for losing weight and have a number of high profile proponents who promote their magical qualities. The idea is simple: survive on nothing but juice for a while and in theory you can survive on a super low number of calories and see the weight really fall off. Some claim you can lose 7lbs in a week or more! But are juice diets really a good idea? Or are they just a lot of hype? Juice is very good for you. Other than having a high sugar content, it is rich in vitamins and minerals and is a great way to get more of both in your diet. But what juice is not is a suitable replacement for your meals. Surviving on juice alone not only means that you are only taking in a very low number of calories but also lacks all kinds of nutrients and elements that we need in our diet. For instance, juice is very low in amino acids. Amino acids are found in proteins and are what our body uses to repair muscle and tissue – and even to create our neurotransmitters. Likewise, while juices are high in vitamins and minerals, no juice contains all of these in high enough quantities so you’re still likely to be deficient in all manner of things – whether it’s calcium or zinc. And what is high in juice is sugar. That means you’re going to be damaging your teeth and potentially causing inflammation while at the same time causing sugar spikes and hunger pangs. There’s no sustenance there and no slow-release energy to keep you going through the day. Of course when you live on just a few glasses of juice, you are going to see rapid weight loss because you’re consuming barely any calories. This does not mean it’s a healthy way to lose weight however. For starters, you’ll be hungry, grump and lethargic the entire time. What’s more, your skin, hair, teeth and nails will suffer. Finally, when you eventually go back to a normal diet, you’ll pile back on the pounds as quickly as you lost them. Juice diets are unsustainable, they are very high in sugar and they are tantamount to starving yourself as far as your body is concerned. You also lose weight when you’re very ill – that doesn’t mean you should consider it as a viable weight loss plan! All that said, it’s still possible to use juice in a healthy way to lose weight. The best way to do this is simply to add juice to your diet in the mornings. A smoothie might well be high in sugar content but if you only drink one, you’re still only adding 100-150 calories to your diet. At the same time though, you’ll be getting a plethora of antioxidants, minerals and vitamins that have a vast number of potent health benefits from improving your muscle strength, to helping you sleep better to increasing your energy efficiency. If you add some juice to your diet, you’ll be able to work out and stay active more effectively because you’ll feel run down and ill less often. Likewise, you’ll have fewer cravings because you’ll be less likely to have deficiencies. 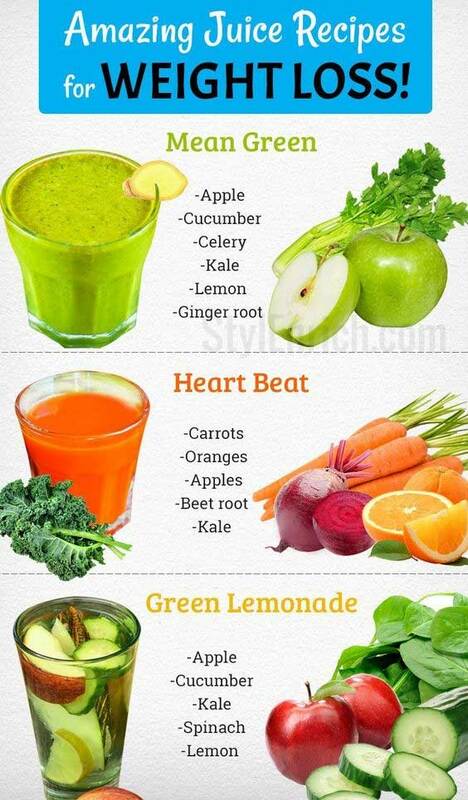 Juice can make you feel great in small quantities and this is a great boost to your weight loss efforts. But that doesn’t mean you should consume only juice. Be smart and eat a balanced diet – there are no shortcuts when it comes to health!